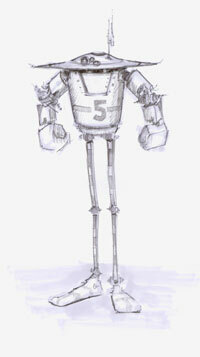 Here is another robot image. 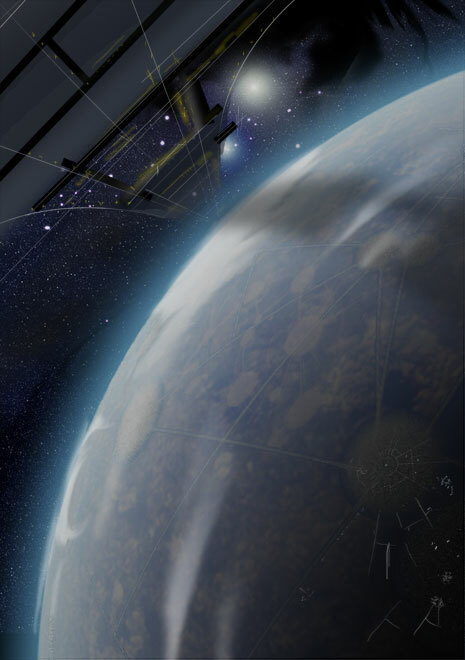 Just practicing technique and coming up with ideas to see if I can start getting a grasp on concept art creation. It’s a tricky thing coming up with something new. Even this guy kind of looks like those Star Wars ‘popup’ bots. One of the main hurdles I’m encountering is the ‘technical’ aspect of the drawings. I suppose that when that gets easier I’ll be able to concentrate more on the ‘coming up with a unique idea’ rather than ‘drawing it convincingly’ technique. One sure fire method of getting better technically is to simply practice. Practice ’seeing’ and then drawing. Train that brain. It can be a bit discouraging when you’ve drawn 10 or 20 drawings and they all feel like they are part of the 100,000 bad drawings that need to come out. But they do need to come out – so hang in there, maybe drawing 21 will be really cool! Ever have one of ‘those’ days? The other day there was this accident on the freeway and it seemed to bring out the worst in drivers. There were all sorts of crazy antics that you probably wouldn’t see if the the freeway was ‘free’ of obstructions. People being rude, arrogant and impatient – ack, and that’s what drives me crazy! Well, after driving around in that sort of environment for a few hours I came home and drew how I felt (not necessarily how I looked!). Yuk, stay away from him! 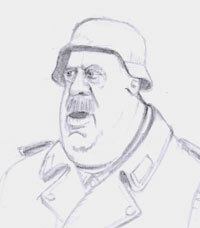 So we were watching some episodes of Hogan’s Heroes the other day and during a brief intermission, while the DVD was paused, I did a quick caricature of John Banner, otherwise known as Sergeant Schultz. Did you know he was actually Jewish and fled Austria in 1938 when Austria was annexed by Germany! Hogan’s Heroes was on TV for about 6 years and I remember watching it when I was 9 or 10 (back when I was short and actually had hair!). I was that young? Oy. Anyway, I still enjoy watching the shows. Funny, the acting was definitely not top notch and I even remember at age 9 that it wasn’t top notch – but some of the actors did a pretty good job and their characters were definitely memorable – especially Klink and Schultz – at least to a 9 year old. They weren’t really complex characters (hey, it’s a sitcom, right? ), but fairly simple. They had a goal and things kept getting in the way. Pretty standard stuff. I always tuned in to see what farfetched thing would happen in Stalag 13 that day (they built a boat in a prisoner of war camp?). Anyway, that got me to thinking about how ‘forgiving’ we are when parts of a show or film aren’t perfectly spot on – but we watch it anyways, and we even come back again to watch the next show! The audience is pretty flexible. I think Hogan’s Heroes had enough of a story and good characters that you come back for more. Well, I did anyways… Of course, for some people the bad acting bits were so bad they never tuned in again. That brings me to what’s on TV today. I don’t watch much, mainly because I’m too busy, but every once in a while (especially when a pilot show comes on) I take the time to test the waters. There aren’t a lot of shows that I have seen and like – for lots of reasons (soap opera acting, poor story, lousy characters, bad content… the list goes on). There aren’t too many shows on today that I would buy 30 years from now to watch again… maybe that just says something about me, but maybe it has something to say about TV programming of today (maybe both). Ah well, off to dinner! Here is something a little different that I created while playing around in Photoshop. It’s my version of a ring world. You can click on the image to view a larger image. Here is another face. 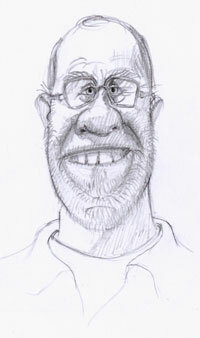 Hopefully somewhat familiar, it’s my first attempt at a caricature of a ‘famous’ person… well Glen Keane is famous to me! If you haven’t yet, make sure you head over to the Animation Podcast and check out Clay’s interview with Glen. Thanks Glen and Clay!! 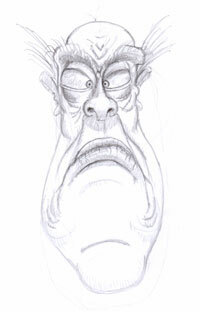 I’ve been doing some quick loose sketches of imaginary faces and here is the first of a few. I haven’t seen Ice Age 2 yet, but it sounds like a fun ride. Because there are soooo many animated films coming out this year I’ll just wait till they release on DVD. A select few will only be rentals (if that!). I don’t know about you, but seeing the trailer from “The Wild” by Disney does not encourage me to go to the theaters – plus, I just don’t have the time!